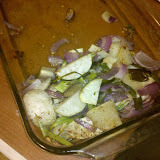 On the first day, I tried roasting some turnips. 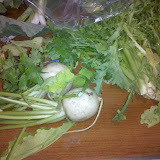 I have never really had turnips before, and I definitely haven’t cooked it before. 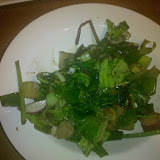 I tried combining the turnips with some garlic scapes (which are my new favorite vegetable), scallions and kohlrabi with some oil and other spices. Meh. I don’t like turnips. They are bitter and boring at the same time. The next day, I was in a moraccan mood. 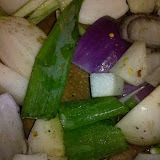 I cut up the garlic scapes, frisee, scallions and some onions and began stir frying it with some turmeric and cinnamon. 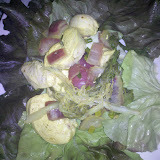 After the onions had become transparent, I added two chopped chicken breasts and half a lemon worth of juice. I have to say, it was quite delicious. 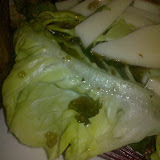 For an added bonus I threw it on top of some red leaf lettuce… yum. Tonight, I wanted to get some mexican food. 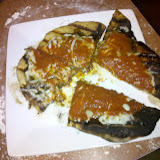 I thought I’d try to make something mexican. But, I had run out of chicken, and didn’t really know what I was doing. 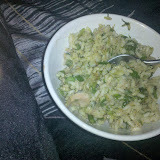 I stir fried some rice with garlic scapes, scallions, frisee. I added cayenne pepper and cumin and some cheddar cheese. It was really dull. I tried adding some tuna to get some kind of something. Still kind of dull. 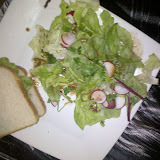 Finally, I added some lime juice. With that, it wasn’t half bad… Not great, but definitely edible. And that’s the last meal. I didn’t seal up my packages very well, so I did waste a good amount of the frisee (that stuff wilts quick!). I can’t wait until tomorrow for the new adventure! I joined an CSA this year. The Alleged Farm, to be exact. I looked at a lot of CSAs, but they won for two major reasons: First, they deliver directly to my office… can’t really beat that. Secondly, and more importantly, they don’t seem to grow green peppers. Green peppers are gross. 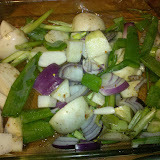 So not having to deal with green peppers is quite exciting to me. Today was the first delivery. 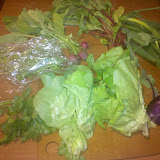 This week had: Arugula, Basil, Beet greens, Bok choi, Garlic Scapes, Kohlrabi, Lettuce, Parsley. 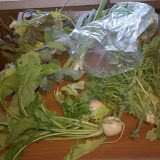 And… now the embarrassing part: I don’t know what arugula, beet greens, bok choi, garlic scapes or kohlrabi looks like. To be honest, I am still not sure what I ate. 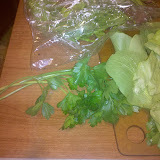 Parsley, basil, and lettuce? Easy. 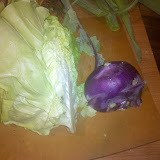 Kohlrabi is pretty easy to identify. But, now things started to get confusing. Bok Choi is supposed to be white, I thought… But I guess young bok choi is green? I had never really heard of garlic scapes. 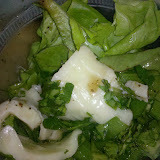 Originally, I misidentified the arugula… But I guess they are just greens? But, now I’m confused. I am supposed to have beet greens… I assume those are the leafy red things. 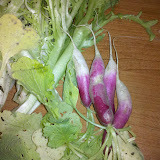 Which leaves me with two bonuses: Scallions and radishes? But it was delicious. 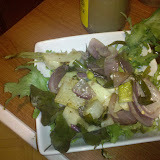 Kohlrabi totally tastes like mild broccoli. Those scallion looking things taste like garlicy scallions (maybe they are scallions, but they were so close to the garlic scapes they took on that flavor?). Garlic scapes are pretty good, but a little overwhelming. 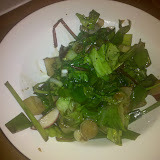 The “radishes” were pretty good, although the greens attached tasted like grass. 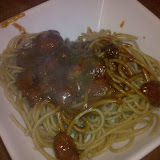 So, after tasting everything plain, I decided to stir fry them all together with a little balsamic vinegar. Talk about overwhelming, the flavor was quite good but every bite was a little of an adventure. 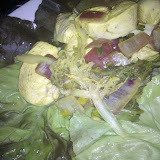 It was pretty fun to eat it in the dark, depending on what I ate I either got a very mild bite of kohlrabi, or nearly knocked over by the garlic scapes and scallions. 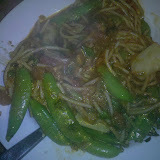 Finally, I threw some of the scallion, garlic scapes, basil in a frying pan with marinara sauce, sugar snap peas and pasta I had left over and made a pretty awesome vegetable marinara. 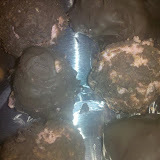 Bakerella makes these fantastic things called “Cake Balls.” I decided to try to follow her recipe. Unfortunately, I don’t like Red Velvet cakes very much. Also, I don’t know what chocolate bark is… According to the internet it’s overpriced chocolate. 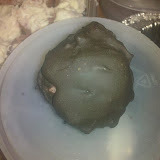 So, I decided to make a strawberry and devil’s food cake. For the chocolate coating I bought some nice semi-sweet chocolate from the local co-op. So I cooked the two cakes last night. I overcooked the the strawberry cake a little bit, but it went relatively smoothly. I threw it in the refrigerator last night. 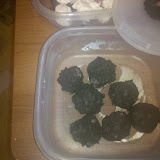 So, today I started to make the balls. 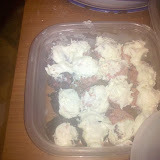 I only bought one can of cream cheese frosting, so I probably under frosted the balls. I then tempered some chocolate. 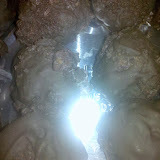 I made chocolate truffles in the past, so tempering chocolate is one of the few things I can actually do. Cooking for Engineers has a good write up on it. My balls are not particularly ball-like. 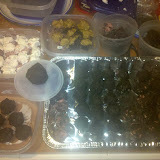 I was also pretty lazy and only did one big coat (instead of doing progressive coats like you do for truffles). But then I ran out of chocolate. So, the end results? 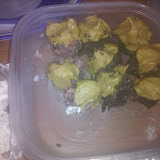 Oh, and they are like little balls of crack. 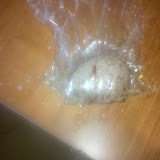 The mega truffle is about three times bigger than any of its brethren, he’s my favorite. Up until a few weeks ago, I had never heard of Sous-Vide. Or, at least, it had never popped up on my radar. But, it’s been super popular on Serious Eats recently. 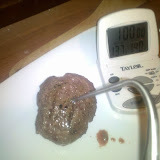 To me, the most interesting links was the one about burgers and the one about doing it without a 400 dollar machine. Fill my cooler with 140 degree water. (My faucet only output 110 degrees, so I had to throw the water on stove to heat it up to 140 degrees. Throw it on the grill for a few minutes. 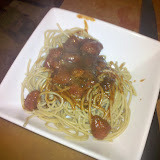 As an added wrinkle, I used some fancy grass-fed beef I bought at the farmer’s market yesterday. Too many variables, I know. A real scientist would have tried with regular beef to compare… but I was hungry. End results? Absolutely delicious. 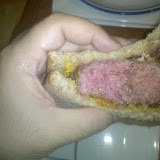 The buger was extremely juicy, and had a really fantastic choice. I put on a tiny bit of ketchup and mustard, but the burger itself was really flavorful. Juicy, and the perfect temperature. I would completely recommend this. I saw this article on Table Hopping. Much like Mr. Barnes, I had my doubts about mixing Strawberries with tomatoes. 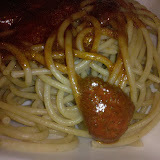 The recipe was so simple I couldn’t resist: Tomato purée, balsamic vinegar and strawberries. I wasn’t able to verify that my balsamic vinegar was “eight years” old, and I used Price Chopper brand tomato purée… so maybe that was my problem. 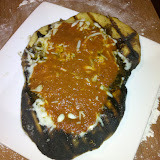 After making the Pea-zza, I was at a loss for what to do with the final quarter of my pizza dough. 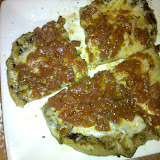 I could have remade the pea-zza, but that’s awfully unadventerous. 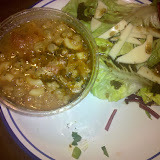 Thankfully, fate intervened this weekend at Honest Weight Food Co-Op. They had free tasting for Granda Pete’s Sunday Sauce, more specifically their garlic sauce. The woman who was giving out the samples said she was going to make a pizza that evening — Now, don’t get me wrong, I know she was a sales person, and there’s a good chance she wasn’t making a pizza — But, it seemed like fate. I bought the $7.50 bottle of sauce and went on my merry way. 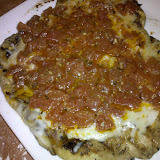 Except for swapping out the sauce, this pizza was exactly the same as previous pizzas. The results? Average. 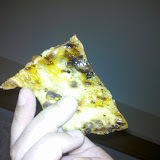 The garlic sauce already had enough oil in it, so the pizza ended up a little too greasy for my likings. 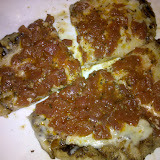 Having the higher quality sauce was nice… it was a lot more “fresh tasting.” Also, for first time, I think I actually undercooked the pizza. 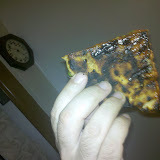 Conclusion: Grilled pizza is awesome. 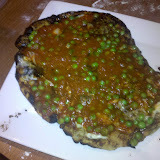 After my inner monologue, the answer to upping my pizza game was obvious: Peas! I have this rule of food: All food is better with peas. Even peas are better with peas, since then you have more peas. 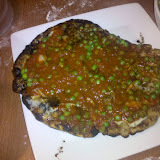 But I had never had a pea pizza. Not until now. 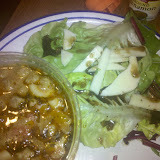 Recipe was more or less the same. I used red pepper flakes this time. 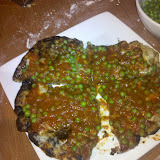 The real change was taking a box of frozen peas, microwaving them until they were warm, and then throwing them on the pizza (on top of the cheese, below the sauce). I tried using less sauce again. End result: Pretty amazing. 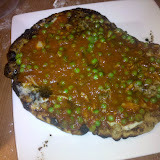 One part of the crust was burned, and the top got a little goopy (peas are pretty wet). 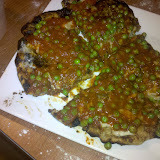 But the peas were nicely cooked, the cheese all melty, and the crust was crunchy on the outside and soft in the inside. I’m really not sure how I am going to do better. When I bought the ingredients for my pizza, it cost $13.79. But, that bought be enough ingredients for four mini-pizzas. Day one was successful enough that it warranted a second go. The first round was a little dull. For round two, I decided to mix things up. 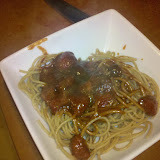 The ground beef didn’t really add much, so I didn’t bother with it again. For the oil concoction, this time I combined oil, red pepper, basil and balsamic vinegar. End results were pretty awesome, to be honest. The bite of balsamic vinegar really added something. I still need to use less sauce (it was too dark to really know how much I added), I want more red pepper (it was still too subtle), and I needed to cook it a little bit longer. 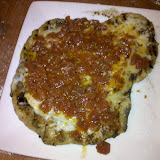 Still not a perfect pizza, but getting better. Entries (RSS) and Comments (RSS).13 queries. 0.310 seconds.